NEWARK, Del.--(BUSINESS WIRE)--Sallie Mae (NASDAQ: SLM) today celebrated 40 years of serving students and families in their pursuit of higher education. When Sallie Mae opened on May 13, 1973 at 1750 K Street in Washington, D.C., the company was a government-sponsored start-up with just seven employees. Today, Sallie Mae is the nation’s No. 1 financial services company specializing in education, employing more than 7,000 people nationwide. Delaware employees celebrated the company’s 40th anniversary in Newark at a ceremony today at the corporate headquarters. They were joined by Delaware Governor Jack Markell and other leaders in government, business and education. Sallie Mae has undergone significant transformations since its creation. The company went public in 1983. It began privatization in 1997 and completed the process in 2004. The company acquired multiple loan origination franchises and receivables management companies to enhance and diversify its lines of business. In 2009, Sallie Mae began to service federal loans on behalf of the U.S. Department of Education. After the federal government ended the Federal Family Education Loan Program in 2010, Sallie Mae refocused its business to emphasize its consumer lending and business services segments. In the transition, its private loan originations have increased, and its emphasis on credit quality and responsible lending remain at the core of its lending philosophy. Introduced in March 2009, Sallie Mae’s Smart Option Student Loan was the first national private education loan product to require interest-only payments during school to reduce consumers’ total borrowing costs. Later it introduced additional payment and fixed-interest-rate options, adding even more choice and flexibility to its private education loan products. Through the years, Sallie Mae has also become a leader in helping families save for college. In 2006, Sallie Mae acquired Upromise and Upromise Investments. To date, Americans have earned nearly $750 million in Upromise rewards to boost their college savings accounts. And, in 2011, Sallie Mae expanded its college savings initiatives with retail banking products: high-yield savings accounts and CDs through Sallie Mae Bank. Sara Patterson is the longest-tenured employee at Sallie Mae with 34 years of experience. She works at the Sallie Mae center in Fishers, Ind. Since 2001, The Sallie Mae Fund, the charitable organization sponsored by Sallie Mae, has contributed more than $125 million to increase access to higher education and support local communities. 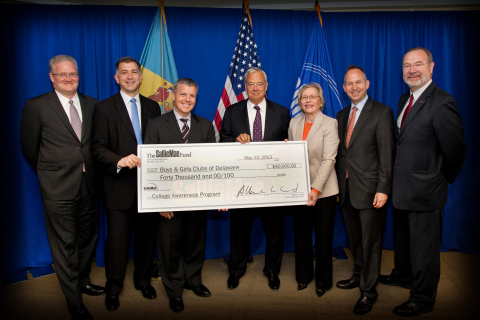 To mark 40 years and to commit to helping the next generation of students dream, invest and succeed, company executives presented a $40,000 check to the Boys & Girls Clubs of Delaware. The program will support college awareness education statewide. Sallie Mae today celebrated 40 years of serving students and families in their pursuit of higher education.